Understanding your local greywater codes is important for a few reasons. If your project requires a permit, understanding the perspective of your regulatory agency will help you work together. If you’re working on policy change, you must figure out how to have a functional code that simultaneously addresses concerns of health and safety officials…. …Historically, plumbing codes did not distinguish between greywater and blackwater (from toilets). 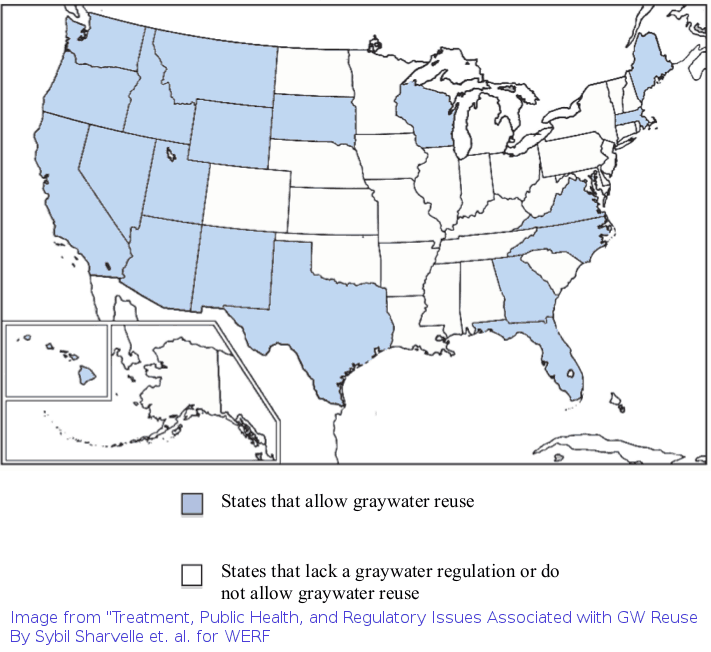 Greywater was required to be collected together with blackwater and sent to the sewer or septic systems, and reusing greywater was illegal. This began to change in the early 1990s when drought-prone California realized this potential source of irrigation water was being wasted. The state plumbing code changed to allow legal reuse. Greywater advocates from that time will tell you how this code, though a positive first step, was practically useless. It treated greywater like septic water, requiring a small septic-type system to dispose of it deep underground (with a tank and gravel-filled leach lines). People interested in irrigating with greywater still had to build illegal systems. California alone had an estimated 1.7 million unpermitted systems. States like Arizona, which followed California’s example code, had a similar experience. In 1998 greywater pioneer Val Little, director of Water Conservation Alliance of Southern Arizona (Water CASA), conducted a survey in southern Arizona and found that 13 percent of residents used greywater, all illegally. The overly restrictive code prevented her from teaching people how to reuse greywater properly, so she worked to change the regulations. The end result was a performance-based code that outlines health and safety requirements. Residential greywater systems that follow the guidelines are legal — without permits, fees, or inspections — so long as the system produces less than 400 gallons per day. Now water departments, NGOs like Water CASA, and the state environmental health department can offer advice, brochures, classes, and financial incentives to encourage safe, legal grey­water reuse. Arizona’s success was emulated by other states, including New Mexico and Wyoming. Eventually (in 2009), California upgraded the state code to remove some permitting barriers for irrigation systems. Greywater codes still don’t exist in many parts of the country. 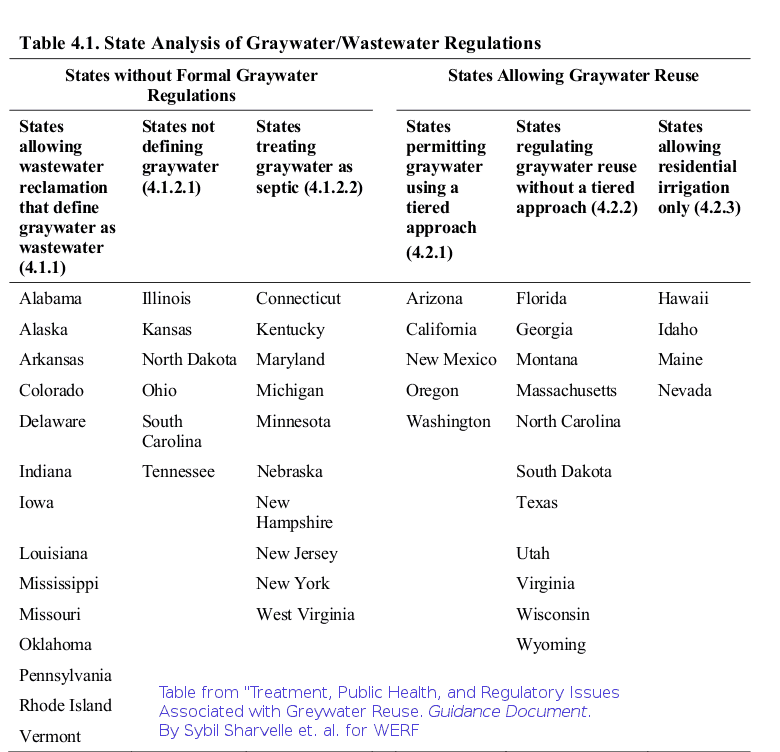 At the time of writing, some states regulate greywater like septic water and require a septic disposal system for it. 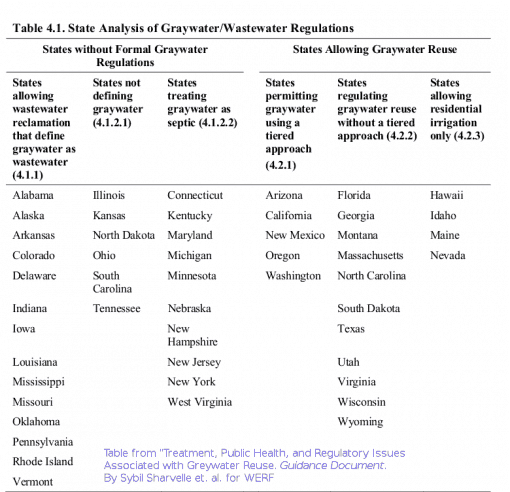 Others, like West Virginia and Massachusetts, allow greywater systems only in houses with a composting toilet. Florida bans outdoor greywater use but allows it for flushing toilets. Georgia allows you to carry greywater in buckets to the plants, but you can’t get a permit to build a simple greywater irrigation system. Washington state’s code allows very small systems built without a permit (following performance guidelines), but all other systems have quite stringent requirements. Oregon requires an annual permit fee. Many barriers still exist for legal greywater systems around the county, but the tendency is toward better, friendlier codes. To find out how greywater is regulated in your state, look at the state’s plumbing codes or the state environmental health department; greywater is either regulated by the plumbing code (building department) or the department of the environment. Or, contact your local building department, environmental health department, water district, or environmental groups, though they may not be up-to-date on the code if a recent change has taken place. more specific details are left out of the code. Prescriptive codes specify exactly how to build a greywater system including what materials and parts can be used. Instead of stating “No pooling or runoff allowed,” they may estimate greywater production based on number of bedrooms in the house and size the irrigation area based on soil type. A detailed code that spells out how to construct a greywater system will result in safer, better-built systems, right? Unfortunately, that’s not the case. Greywater systems are complex; they interact with the living world of soils and plants, and are influenced by water-use habits, fixtures, climate, and physical layout of the house and landscape. Unless the code considers all these variables (and in fact it never does), it results in overly restrictive requirements, adding unnecessary cost, or creates an inefficient irrigation system. When a code is out of touch with reality, people ignore it and build illegal systems, with no guidance. After all, since it’s common sense to reuse the water we already have, why should it be difficult to get a permit, or the fees be expensive? National standards for indoor reuse systems are being developed. NSF International recently released water quality guidelines as part of their standard for nonpotable indoor reuse (toilet flushing). NSF 350: Onsite Residential and Commercial Water Reuse Treatment Systems is, according to NSF, “a revolutionary standard that sets clear, rigid, yet realistic guidelines for water reuse treatment systems.” By meeting these testing requirements and receiving certification, companies (who can afford the expensive certification) should find it easier to gain permits, a positive step for indoor reuse and large-scale commercial greywater systems. Performance-based. Guidelines outline health and safety requirements. For example, no pooling or runoff, minimize contact with greywater, keep all greywater on the property where it’s generated, etc. Code is statewide with a mechanism in place to educate local regulators. Text on this page is an excerpt from © The Water Wise Home: How to Conserve, Capture, and Reuse Water in Your Home and Landscape, by Laura Allen.